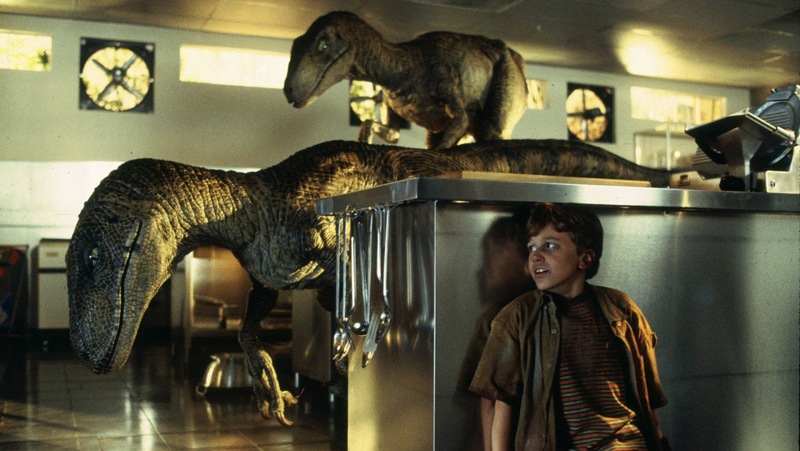 Jurassic Park, Steven Spielberg's early 90s blockbuster, is the latest movie to be revived and retooled in 3D format for post-Avatar cinema audiences. But, to paraphrase an utterance made in the Michael Crichton adaptation, the marketers behind this film were so preoccupied with whether or not they could, they didn't stop to consider if they should. Watching the feature through adult eyes, it's quite clear the film should have been left dormant. Observing Jurassic Park objectively, without childhood fondness providing any prejudice, the faults become apparent, clear and annoying incredibly quickly. The script is wildly uneven; a laborious introduction leads us to an elongated plot-free second act before abruptly, and anti-climatically, an ending arrives out of nowhere. It's perhaps the only feature in history not to feature a third act of any description - a group go to an island, get chased by dinosaurs... and then it ends. Structure aside, the plot is a bit on the thin side too - as mentioned above, nothing much happens aside from patronising exposition regarding the genesis of the island followed by lots of dinosaurs chasing after our nominal protagonists. What amplifies this lack of purpose is the potential imbibed within the premise to make an interesting point or two. A more intelligent film-maker could have seen a rather interesting subtext to the tale - a Frankenstein-esque story of capitalism, where avarice breeds avarice. Instead the never knowingly cerebral Spielberg presents kids hiding from cartoons for the best part of two hours. The problems don't end here. Much like in Star Wars, John Williams’ shameless bravura compositional style has created a theme which manages to hide many of the scripts’ gaping holes. It’s enough, it would seem, to combine an overly-saccharine symphonic performance with a camera pointing at actors stood still with eyes as wide as they can open them – it’s contrived awe which never wrings true (particularly in context with some CGI which has aged incredibly poorly) and suggests emotional manipulation will be at the heart of this cynical movie. Spielberg, however, has not realised that, grand scores aside, to manipulate audiences, you've got to give them characters or, at the very least, reason to care. Jurassic Park boasts not a single character it's possible to develop feelings for and, aside from age, gender and height, each character bears no real traits which separate them from each other. Instead, the film consists of running and more running from CGI monsters – it’s taken the humanity out of cinema entirely and rendered the medium nothing more, nothing less than a distraction; the most shameful accusation you can make of the medium. There are no lessons to be gleaned, no emotions to be felt, no characters to relate to – it's shameful. Jurassic Park is not a film that can be accused of having a heart or a soul – to have these qualities would suggest that there was at least one character who possessed either of these. Instead, all the humans who populate the movie seem to own nothing but legs, which allow them to run and run, and mouths which allow them to scream voluminously and with regularity. It can not be said that Jurassic Park is a quiet film. Depth is a problem which blights the whole movie too – not just in terms of character development, but in terms of dimensions. In Spielberg’s original version, the grandiose dinosaurs lacked weight and depth as most CGI of the time did (and indeed does now). What we have, in the latest 3D adaptation, is something which looks akin to a pop-up book – flat object piled on top of flat object. 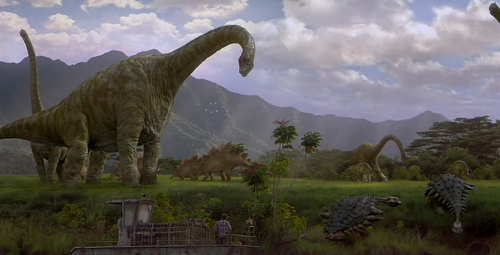 There’s a flat T-Rex in the foreground stood in front of another pan-caked dinosaur. The trick to enjoying this film is to let John Williams’ score convince that you are seeing something spectacular rather than concentrate on the deflated imagery in front of your eyes. In a career of overly sentimental scores, Williams' compositions for Jurassic Park may be his most troublesome; triumphant fanfares celebrating nothingness – there’s something upsettingly, disgustingly nihilistic about this. There’s spectacle to savour of course (if all you are after in a film is computer generated images of extinct species) but, there’s no substance. Or point. It’s a film, and style of film-making, which should have been made extinct many years ago. Reviving these dinosaurs can only lead to trouble.